A scroll saw is probably something you have come across if you were looking for a power tool designed to cut irregular shapes and curves in wood, metal or some other material. 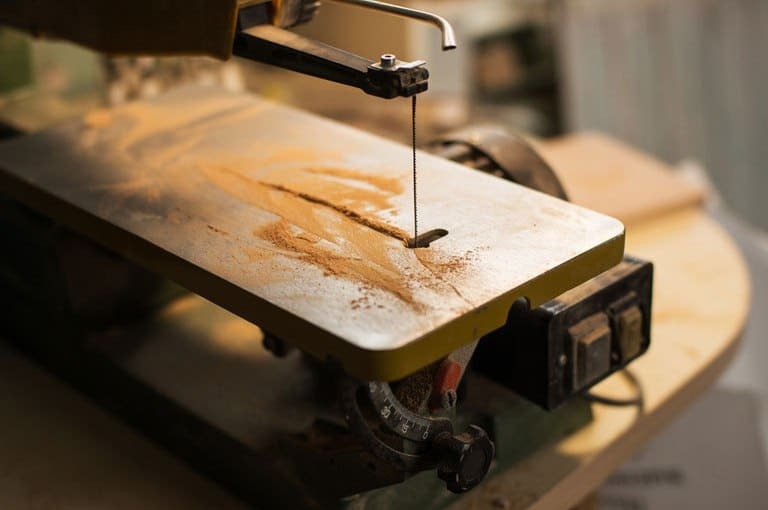 There are a lot of models on the market and new ones are coming on a regular basis, so it is crucial to understand how you can get the best scroll saw. Precisely this will be our mission here. We will include the best models and we will guide you through the selection process. In this section, we will guide you through the entire process of selecting these power tools. Think of it as an educational section where you will learn all about the main features elements and how scroll saws actually operate. After that, you will be ready to start a quest for the best scroll saw for your specific needs. Straightaway, we must say that these are simple and complicated tools at the same time. They use the latest technology and advanced systems in order to provide accurate and precise cuts. This is the first and the most important factor to take into consideration. It refers to the distance between the back of the blade and the rear part of the saw. 16-inch models are usually considered as great for beginners. 20 or 21-inch units are better and they can meet the requirements of more demanding users. 30-inch scroll saws do exist, but they are very expensive and they are usually needed to extreme professionals who have the most advanced cutting requirements. The bottom line here is that scroll saws between 16 and 21 inch are the most appealing choice. There are two main facts to know when it comes to blade types. You can choose between pinned and unpinned type. The first type or pinned are used for rougher cuttings when the fine cuts are not needed. They also allow for you to cut thicker woods and to meet rough applications. The second type or unpinned blades are used for opposite requirements. When you need fine cuts. In addition, they are available in a wide range of sizes and features, so they allow for you to cut through anything and in any thickness you want. As the title suggests, there are two main factors here to consider. How are you going to replace the blade? First of all, the blades must be replaced every single time you are making a different cut. Those that require tools are complicated and annoying. You will have to invest so much time into changing them so they are more appealing to users who make just one type of a cut. Toolless are a more appealing option. They can be replaced within a few seconds and there are no issues here. An important element when it comes to the best scroll saw is the blade adjustment system. It can be a knob or a dial that allows you to tighten or lose the blade. The location of this knob is more important than you may believe. It is located at the back, you will need a lot of time and patience to adjust the blade. This is common on 16-inch units. Just keep in mind that you will have to adjust the tension of the blade for most cuts, so this is an important factor to consider. This is the main element of a scroll saw. It can make a huge difference when it comes to the cutting capabilities. You must take into consideration the size of it, the main material and the bevel capacity. Those that are made from aluminum and are smooth will do the job just perfectly. A separate feature is known as bevel capacity or the ability of the table to tilt to the right or left or both. If it has this system, you will be able to cut more complicated cuts and a saw will meet more demanding requirements. Try to remember that some models can bevel to one side only, while others can bevel on both sides. Here we have one of the most important factors to consider. If you read our reviews carefully, you probably will see that more professional models have a higher difference between the slowest and the fastest movement of the blade. Simpler units have a smaller difference. In essence, variable speed control allows you to cut different materials. When you need a slower and more precise cuts, you can use a slower speed. When you need to cut something as quickly as possible, you can use a faster blade movement. All you have to know is that a variable speed adjustment is a mandatory feature and the one you must have. How efficient a dust port is and how good a scroll saw is in eliminating dust from the cutting area is an important factor to consider. These saws are known for not being very effective when it comes to dust elimination, so make sure to get some things right. First of all, a bigger dust port is always a better option and the adjustable air blower is a must. It can be adjusted so precisely that it will remove the dust as you are cutting through wood. All of these saws must be stable when you use them. Cutting capabilities are important and require them to keep the material in place as long as needed. Always make sure that a scroll saw is stable enough so it can old the material strongly in place as long as needed. Of course, this factor is commonly paired with the throat size. This is the element that provides the movement of the blade. It is commonly called the rocker arm and there are two options. The first one is a larger arms that moves alongside the blade. It is more appealing choice for some users, but it is known that it generates more vibrations. The second type is a much smaller rocker arm which generates far fewer vibrations, so of course, you are able to make more accurate cuts. It is up to you to decide which type you actually need, so it all comes to the personal preference. The top arm of a scroll saw can be raised or it can be permanently positioned. It is up to you to decide which or what you will need. In general, lifting arm is useful if you are planning to use the saw for more demanding operations and to world from the top to the boom of a table. It is a bit rare feature that doesn’t come included in all scrolls saws so finding the one that has it may be a bit more complicated. The position of the on/off switch is important. It should be located at the top of the saw so you can quickly access it in a case of emergency. Avoid models that have switches on the back or somewhere else, so you must stand up in order to use the switch. Almost all scroll saws are powered by the electric motors. But the power of it is what varies. In general, you can choose between models of 1.2 Amp, 1.3 Amp and more powerful. Of course, there are less powerful versions as well. But, because the blade is small and a scroll saw will be used for thinner or smaller cuts, the power of the electric motor isn’t the crucial factor to consider. As a matter of fact, all units with a power of 1.2Amp or higher will meet all your requirements. As simple as it sounds, storage compartment on a scroll saw is a great advantage. Think like this. You will have a lot of different blades all around the saw. Where those blades and tools will be placed? It is important to add the fact that most models do come with a built-in storage for blades and other elements. Sadly, there are plenty of models that don’t offer this advantage, so you will need an extra box. Yes, it is one of the simplest features found on a scroll saw, but also one of the most important. Best scroll saw blades for hardwood will be almost useless unless they are paired with the working light. It allows for you to perform more delicate cuts and to improve the overall visibility. Although this is a common feature at the moment, some scroll saws have a poor-quality working light, so it is almost useless. Look for LED lights due to the fact they are the most powerful and offer the best overall result. Avoid those units that come with obsolete bulbs that are poorly positioned on a saw. They won’t be very useful. As the user manual of your new scroll saw will indicate, a lubrication is mandatory or your particular unit doesn’t need it. However, most of them do need it and after some time, crucial bearings and elements will have to be lubricated. Always pay attention to this factor and make a proper maintenance. It can make a huge difference and it means that your saw will last as long as possible. Without lubrication, the bearings will get damaged and you won’t be able to use your saw. This isn’t something that warranty covers, so you will need an extensive repair of the saw or you will need a new one! Believe or not, scroll saws do come with stands, but they are rare. In general, you will have to get a stand additionally and there are purpose made units, which are compatible with just one type of the saw and generic, which can be used for all kinds of scroll saws. Some users like making their own stands which will meet their more specific needs. If you are one of them, make sure that the saw is stable and the legs of the stand are adjustable. This can make a huge difference and make your scroll saw far better. Adjustable legs are especially needed if you are planning on using the saw on uneven terrain. The first model here is suitable for professionals and for those who are planning to use it on a frequent basis. It is known for its precision, but also for the durability it offers to its owners. Most of you will be completely satisfied with this unit and won’t seek a new one for a long period of time. It is simply the best scroll saw. We all know that scroll saws are loud and they have vibrations. Well, the tested model is better in those situations, simply because it offers fewer vibrations and noise. The main advantage is actually in the two arms that link the actual saw. Their design is modern and sophisticated, therefore the just mentioned advantages are possible. In order to change the blade, you will need a couple of minutes and bare hands. There is no need for any tool. In addition, the flexible dust blower is an appealing addition and one of the reasons we rated this saw so high. The model in question is actually more than just similar to the first one here. There are a lot of similarities which will make you believe they are the same units. However, there are a lot of differences as well. The tested model is great for semi-professionals and will probably meet most of the requirements professionals have. The model we tested came without a stand and a working light. But, these two accessories can be added to the order. They are definitely useful and beneficial for us all, but their price is high. A combination of all three will make this scroll saw the most expensive on our list. Within a few seconds, you will be able to change the speed of the blade on this saw. Paired with the best scroll saw blades for thick wood this unit will cut fast and effortlessly. The variable speed control offers between 400 and 1750 SFM. While the previous model offered a stand and a working light only as an addition, this one comes with two accessories included in the package. As such, it is one of the best and the most appreciated scroll saws with a stand. It is also commonly rated as the best small scroll saw due to small, overall dimensions. The table on this scroll saw is special because it has a bevel feature. It allows for the users to tilt it up to 45 degrees in any direction and to make more demanding or more complicated cuts. Despite the fact this isn’t a professional model, a bevel feature is highly desirable. Maybe this is the smallest feature of them all, but it is extremely important. Thanks to the LED, you can cut perfectly when the visibility is poor or at night. It also allows you to make more accurate cuts. What if you are looking for a scroll saw that offers a lot of features and advantages, but it is still an affordable model? Then you will need the one we have here. It is loaded with almost all features you will ever need and it is well-made. These were the main reasons why the tested model is so popular at the moment. The electric motor is reasonably powerful if we know that this is a 16-inch saw. This simply means that you get plenty of power and speed to cut most materials. Of course, the electric motor is quiet as well and durable. The dust port in this case scenario is 1 ¼ inch and it is perfect. It will make sure there is no dust that may annoy you and it will extract it completely. It has been paired with a dust blower which also makes the system better and more sophisticated. The model in question is the most affordable of them all, so chances are low that you will ever find a better value for money. Despite the price, this isn’t some useless scroll saw that shouldn’t be used. It is a sophisticated unit that has a lot to offer and the package is just great. The table on this model can bevel to the left for 45 degrees. It is a real pleasure being able to have an advanced feature like this on an affordable scroll saw. It allows for you to use it for more demanding cutting operations. Surprisingly, this model can use two blades, a standard one, and a 90-degree angle type. This is possible thanks to the clever design and plenty of additional elements. Keep in mind that in the package you get 3 blades with this scroll saw. Here you can find the best scroll saw and there is a model suitable for each and every one of you. These 5 models are great and they are the most advanced and the best value on the market in 2018. We tested each model separately and discovered that the DEWALT DW788 is simply the best. It gets 4/5 stars and it is simply the most advanced and the best-made scroll saw on our list. Of course, this doesn’t mean that other models are bad. On the contrary, other 4 models are decent as well and they may be the best alternative if you are looking for an entry-level, semi-professional or a budget-friendly scroll saw. After all, there is a scroll saw for each type of user.